Hearing does not necessarily translate to listening. Can you hear me now? Just because sounds are heard by no way implies that active listening is a part of the process. Hearing is defined as having the ability to hear. Listening is the act of giving attention to a sound or sounds. Hearing is a passive act, while listening is an active skill. Serving to strengthen relationships, facilitate problem solving and conflict resolution, and improve personal and professional development, active listening is a valuable skill. Listen Up! Here are 5 steps to make you a better active listener. Maintain comfortable eye contact (if appropriate) and a constant level of focus and attentiveness for optimum comprehension of verbal and non-verbal communication. Create a mental barrier reducing the level of interference of external and internal influences to better concentrate on unbiased comprehension. 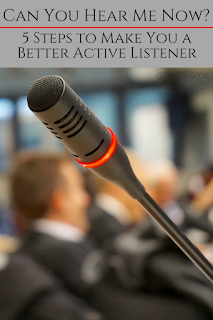 Listen without interrupting the speaker, allowing adequate time for reflective pauses before replying. Consider thoughts for responsive statements after listening to the complete message. Pay attention to highlights and messages to establish a clear understanding. Mentally preparing to question or reply detracts from the effectiveness of active listening. Evaluate information presented for an assessment of the value of message. Demonstrate an understanding by rephrasing the speaker's message for clarification.